MMT is the socialists’ dream. It officially stands for Modern Monetary Theory but a more appropriate name would be More Money Theory. Because MMT is just a fancy name to justify more money printing, more deficits and more debts. Socialists love MMT, because for a sovereign nation, it justifies constantly living above your means. This is of course nothing new for the US which has practised MMT for soon 70 years. Not since the early 1960s has the US had a real budget surplus. Europe has had socialist governments for decades, but for the US it is a relatively new phenomenon. Alexandria Ocasio-Cortez (AOC) has now picked up the baton from Krugman, arguing that socialism and deficit spending is the solution to the US problems and the world’s. Trump, who normally is as far from a socialist as you can get, is nevertheless applying MMT to the US economy by continuing to spend money that doesn’t exist. His tax cutting and uber-spending, combined with the imminent downturn of the US economy, will soon put the US in the same category as countries like Italy. That is what is called the basket case category where default will be unavoidable. As opposed to Italy, the US can print its own money. And they continue to do at an ever increasing rate. 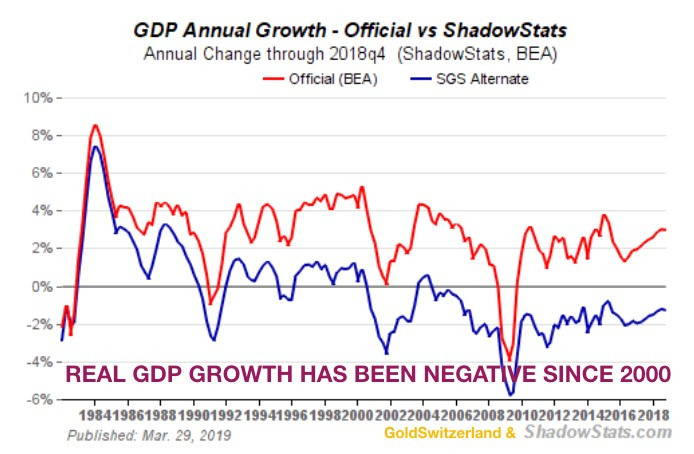 Just look at the chart below which shows the only way the US government knows how to grow GDP. But we must remember that printing unlimited amounts of worthless money leads to a total debasement of the currency which is just another form of default. From 1970 to 2008 it took $0.77 of debt to produce $1 of GDP. From 2008 to 2019 it has taken $4 of debt to produce $1 of GDP. In simple terms, the US is running on empty. How can anyone believe that any of the values we are looking at today are real. Bezos and his wife are worth $150 billion and his company Amazon has a Market Cap of $1.4 trillion. These are just fantasy numbers. And so are all the other billion and trillion dollar values that have been created out of nothing. So the US government has printed $13 trillion since 2008. And the world as a whole has increased total debt by $125 trillion. It is all this money that has created the illusory wealth in the world in this century. Very few people realise that these telephone book numbers will all vanish in the next crisis and lose 90 to 100% in nominal value. Looking at the growth in GDP, based on real inflation (ShadowStats), real GDP growth has grown by less than 2% annually since 1990. And since 2000, real GDP growth in the US has been negative. The reason for that is obvious. The US has printed $4 to achieve $1 increase in nominal GDP. But the nominal figure is totally meaningless since it has only been achieved by printing $13 trillion of fake money that has ZERO value. How can anyone believe that you can create wealth by just creating money out of thin air. If an individual prints fake money, that would be a blatant fraud and he would end up in prison. So why isn’t it fraud when a government prints money? Well of course it is fraud of the highest degree. A country that creates debts and prints money is defrauding its people. But sadly the people are unaware of the misdeeds of their government. They don’t realise that the value of the dollar, pound or euro in their pockets is declining precipitously. 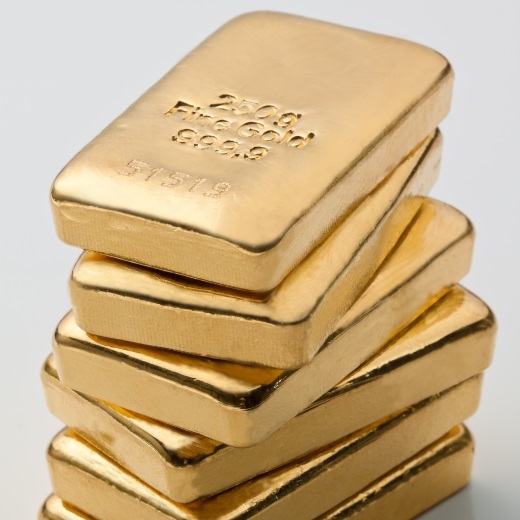 The best way to determine the decline of paper money over time is to measure it against gold. All currencies are crashing against gold in this century. 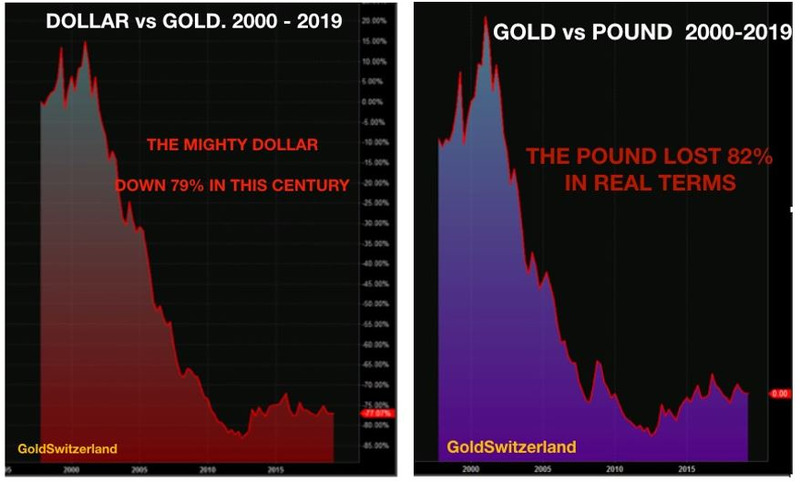 The dollar has lost 79% since 2000, measured in gold and the pound 82% as the charts below show. The decline has paused since 2012 but the next leg down is imminent. Within the next 4-6 years, the move down should take the dollar and the pound to their intrinsic values of zero. This fall will be accompanied by unlimited money printing in a final and desperate attempt by central banks to save the global financial system. Sadly, they are guaranteed to fail. In the short term, gold seems to have stalled just below the critical Gold Maginot Line at $1,350. Just like the French did in WWII, the BIS and the bullion banks are defending this line strongly. The Germans pushed through the Maginot Line at its weakest point and the same will soon be the case with the Gold Maginot Line. Gold has already broken through this line in many currencies like the Australian and Canadian dollar, the pound, the Swedish and Norwegian kroner etc. Thus it is only a matter of time before the US dollar line is broken at $1,350. Investors who hold gold for the right reasons are not concerned. Gold is eternal money and therefore short term moves are irrelevant. We know that when governments and central banks behave irresponsibly, like they have done for the last 100 years, it will all end badly. When it does, gold will reach levels that no one can imagine today. But when that happens, the world will be a much worse place to live. So best to enjoy the present times as long as they last. The fall of the EU and the Euro is inevitable. The unelected and unaccountable Brussels elite is desperate to stop the sinking ship from going to the bottom. They are doing what they can to stop Brexit. Just like they have interfered in Ireland, Denmark, Greece, and Italy. But they will not succeed. Italy’s economy and banking system is in a hopeless position and the coming crisis and default will have severe repercussions for French Banks, Spanish Banks, the ECB and thus the global financial system. That is one of the potential triggers for the next global crisis which will be much bigger than the 2007-9 one. I discussed some of these issues in an audio interview on King World News last week. The inevitable global financial crisis is approaching fast. A final hurrah in stocks is still possible. That can finish abruptly or it can take a few months. Once it finishes we will see the biggest secular bear market in history. Gold’s next move up is not far away. There is still a short time when gold and silver can be bought at reasonable prices. But we are already experiencing supply problems in silver. So there is not much time left to acquire proper wealth protection in physical precious metals. Once the paper shorts run for cover and ask for delivery, there will be no metals available. I would advise investors not to wait for that moment.